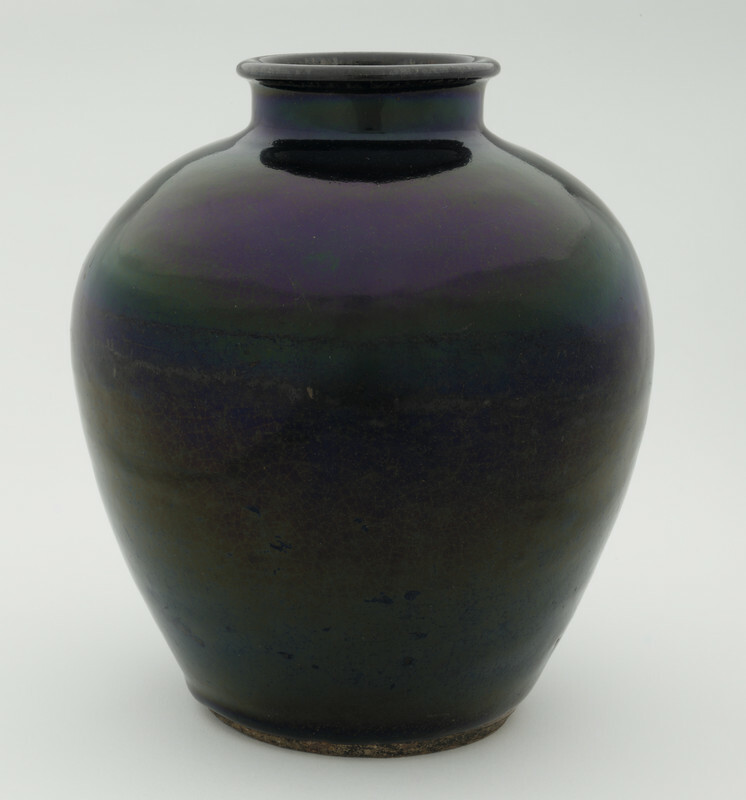 This dramatic, glossy jar is glazed with a type called "pitch black" by the Japanese. Together with copper-green, cobalt-blue, and opaque white, it was popular for use on small tea-leaf storage jars such as this one, as well as on other still-smaller wares. The unusual depth of color - a feature that no doubt appealed to Freer, who regarded the vessel as "very fine" - was obtained by applying in two coats to a bisque-fired jar. Small glazed tea-leaf storage jars of this sort were probably intended mainly for use in shops selling tea, for storage and display. In the Peacock Room, however, it was placed on a high shelf, next to La Princesse du pays de la porcelaine and near other dark, glossy ceramics. "Tea-leaf storage jar," in The Peacock Room, Freer Gallery of Art, Smithsonian Institution, Accession No. F1898.435, Item #3102, http://www.peacockroom.wayne.edu/items/show/3102 (accessed April 19, 2019).